This entry was posted on April 1, 2016 by Lightning Labels. 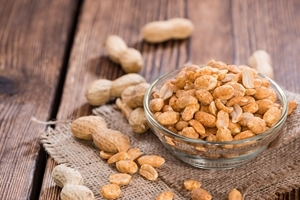 March is National Peanut Month, and any business that distributes, manufactures or sells products involving this beloved ingredient should take the opportunity to raise its brand visibility through specialized marketing strategies. Although the most important responsibility of these entities is to ensure that their products are properly and clearly labeled to ensure individuals with allergies do not end up consuming them, this is far from the only task involved in daily operations. Rather, peanut products are extremely popular, and subsequently lead to high levels of competition in the marketplace. Firms that effectively market and position their products will be in better positions to excel past their competitors, and an event like National Peanut Month is a great chance to gear up these initiatives. Peanut butter labels don't need to all be the same. Aside from having peanut allergy labels in clear sight on all packages that are required to have such notifications, businesses can also incorporate recipe labels to give potential buyers even more reasons to purchase. Cookies, cake or more unique, off-kilter recipes can make all the difference in the world when a consumer is choosing between one peanut butter product and another. What's more, your allergy-related stickers don't need to be just like all the other ones out there either. If you allow any of the product packaging to clash with the true branding design and information involved, the items will simply not be as attractive to passersby in the grocery store. Consider using custom peanut allergy labels to improve the overall aesthetic of your products, and design them in such a way that flows with the other content on the packages. At the end of the day, the most creative branded materials will tend to fare best on the shelves, and you should take National Peanut Month as an opportunity to refine your tactics. Peanut lovers do not need many excuses to indulge in their favorite snacks and treats, meaning that you ought to be keeping your labeling and marketing programs fresh throughout the year. When you need quick turnarounds on printing orders, consider using Lightning Labels, an industry leader in speed and accuracy of such products. Lightning Labels offers a range of custom labeling services, and can be useful in any product packaging situation.